Tiger Brands is right on-trend with its new Jungle Oatso Easy Energy On The Go in a cook-and-chuck tub – with new research from Mintel explaining that part of the decline of cereal in the US and elsewhere is because the millenial generation find filling and cleaning a bowl of crunchy stuff too much like hard work! According to Spoor & Fisher, a South African law firm specialising in intellectual property, one of the first logos they ever registered was a ‘Tiger peeping through long grass’ – around 1921! The logo has remained largely unchanged over the years, but the eras have called for fresher packaging, to ensure the brand remains relevant and in line with ever-changing times. The brand’s first launch into the ‘ready-to-eat’ breakfast segment came in 1990 with the introduction of Jungle Oatso Easy, billed as the ultimate hot oats experience in a convenient and portable format. 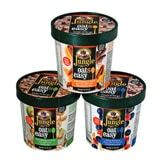 The latest Jungle Oatso Easy 50g tub range, designed by a sub-division of Hardy Boys (KZN), calling themselves ‘The Disturbance’, includes four tasty variants: Apple and cashew nuts; Peaches and almonds; Chocolate chip and flavoured fruit pulp; and Cranberries and blueberry fruit. The paper-laminated tubs and lids are printed offset litho and imported from Pacific House (China). Steam-venting holes in the lids cater for consumers who pop their tubs into the microwave as they prefer their oats to be thick. Oatso Easy suddenly became even more convenient for that on-the-run breakfast! The cereal category is in decline but Americans still buy $10-billion of it annually, and it has thrived over the decades, at least in part, because of Its convenience. What’s easier to eat than cereal? Fill a bowl, pour in some milk/juice and enjoy. Now new research has come up with another reason for its dipping fortunes….